Are you confused about your career decisions? Do you feel lost between what to do and what not to do? You think you are facing the ultimate dilemma of ‘to be or not to be’, just like Shakespeare’s Hamlet? Feel like you can’t know, can’t decide, can’t pick, what’s right and what’s not right for you or your career or your future? STEP, the Strategical and Tactical program of Punjab Group of Colleges, has the answer to all your questions. The institute allows you to access a career advisor anytime and anywhere you want. There are many facilities for you to seek guidance for any sort of educational purposes. If you ever feel lost and think you need to find a career consultant all you need to do is to turn to STEP. Understanding the overwhelming dilemma the youth has to face during the age of loss of innocence and coming of age when they are expected to make decisions about their career paths and plan a future, STEP has set a dedicated Student Advisory & Counseling Department. At STEP students can avail career counseling services through many means. Firstly there are career coaches available at STEP institutes. They will help you through all your difficult decisions. There will always be career guidance counselor present at your convenience. STEP allows you to seek answers to all your queries on their social media platforms. You can send in your queries anytime you want. Their website also allows you to engage and interact with a career counselor whenever you want. 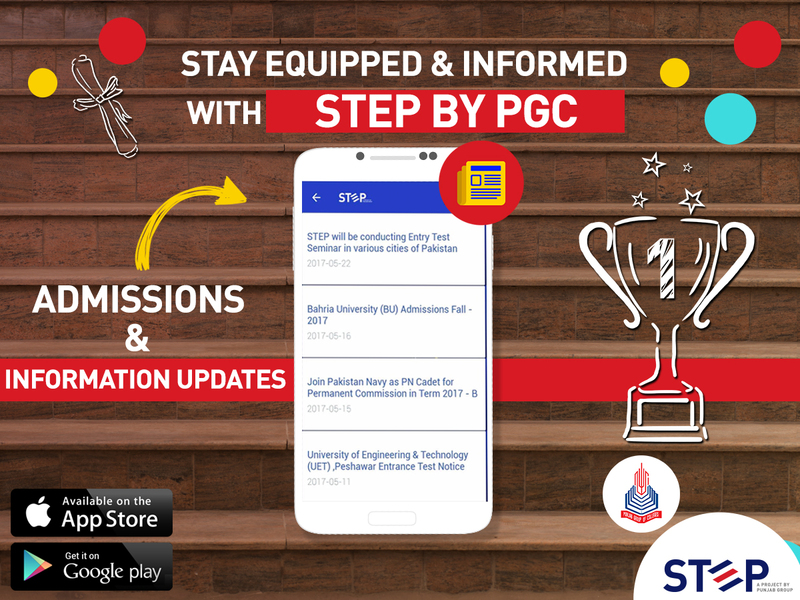 STEP’s first ever comprehensive entry test preparation app also has a feature for you to be able to contact an online guidance counselor. This means that you can approach a professional career coach at your ease. You get the best career counseling services at STEP, any kinds of queries you may have regarding your education, your future profession or any academic institute you can inquire career guidance counselor about anything. STEP also provides career counseling for working professionals who need to acquire an insight into boasting their career through obtaining higher degrees and additional qualifications. A series of seminars and workshops also takes place every year at STEP that accommodate the needs of career guidance and counseling for students at different levels. Many motivational speakers, career coaches and trainers are engaged to help students and professionals to navigate through their career and educational decisions. Anything you want to know any deadlines or dates for admissions, any professional advice you need, any career scope you want to know, or looking for a career boast? Do you want to learn about any specific educational courses? Want to know about entrance tests and learn the syllabus? Are you interested in best career hacks, or want to know which course or degree would give your future just the boast it need? At STEP you will get answers to all that you need. Utilize the best ever career counseling services to learn what’s important.